Apollo server provides a couple predefined errors, including AuthenticationError, ForbiddenError, UserInputError and a generic ApolloError. These errors are designed to enhance errors thrown before and during GraphQL execution. The provided errors focus on debugging a Apollo server as well as enabling the client to take specific action based on an error. When an error occurs in Apollo server both inside and outside of resolvers, each error inside of the errors array will contain an object at extensions that contains the information added by Apollo server. The first step to improving the usability of a server is providing the error stack trace by default. The following example demonstrates the response returned from Apollo server with a resolver that throws a node SystemError. To disable stacktraces for production, pass debug: false to the Apollo server constructor or set the NODE_ENV environment variable to 'production' or 'test'. Note that this will make the stacktrace unavailable to your application. 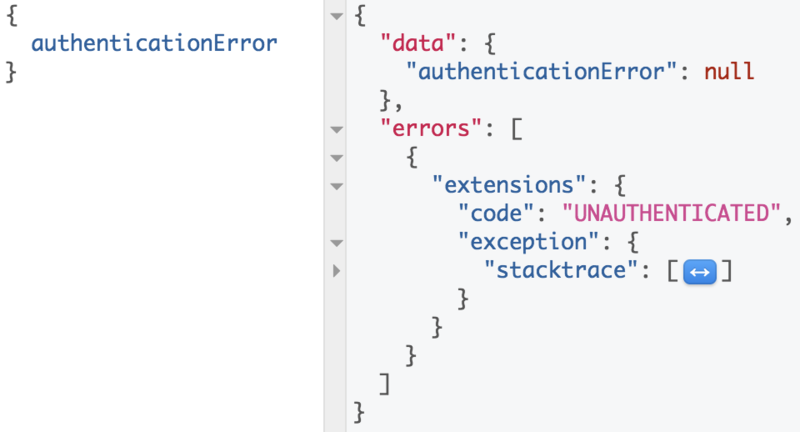 If you want to log the stacktrace, but not send it in the response to the client, see Masking and logging errors below. In addition to stacktraces, Apollo Server's exported errors specify a human-readable string in the code field of extensions that enables the client to perform corrective actions. In addition to improving the client experience, the code field allows the server to categorize errors. For example, an AuthenticationError sets the code to UNAUTHENTICATED, which enables the client to reauthenticate and would generally be ignored as a server anomaly. When clients provide bad input, you may want to return additional information like a localized message for each field or argument that was invalid. The following example demonstrates how you can use UserInputError to augment your error messages with additional details. If you need to define other error codes that are specific to your application, you can use the base ApolloError class.